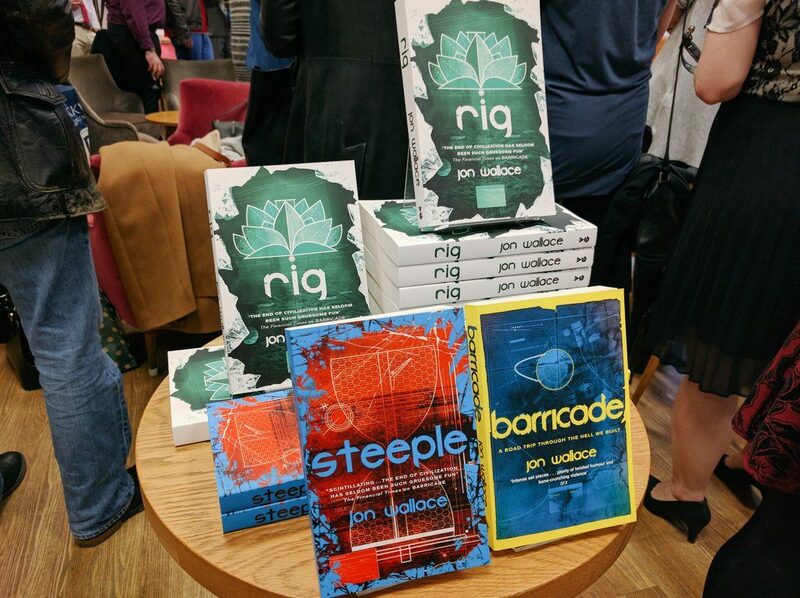 Books on show at the Rig launch in 2016 at Blackwell’s bookstore, London. I’m the author of the Kenstibec trilogy, published by Gollancz in England and Heyne in Germany. The books are narrated by anti-hero, Kenstibec, a member of the “Ficial” species – a race of near invulnerable super beings created to save humanity – but who tried to wipe it out instead. The attempt failed, and the Ficials now live in barricaded cities, besieged by the remnants of humanity: feral, wandering, half mad tribes. Barricade tells the story of Kenstibec’s trip across the future wasteland of Britain, transporting a fellow Ficial from Edinburgh to London. It’s the start of an incredible, high octane journey over three books that’s been loved by the Financial Times, Tor.com, The Sun, The Big Issue and Forbidden Planet among many others. Explore the navigation for more details and reviews.